So far we've mainly used the concept of TV practice or metronome exercises to work on non-musical mechanical things like right hand picking and left hand finger strength. But in this lesson I'll show you how you can practice improvisation with the metronome and get your fingers used to going instantly where you mind wants them to go. In this tutorial we've recapped all the techniques and sounds that we've explored in this chapter, and I hope it's all on the way to making sense and becoming an active part of your playing. 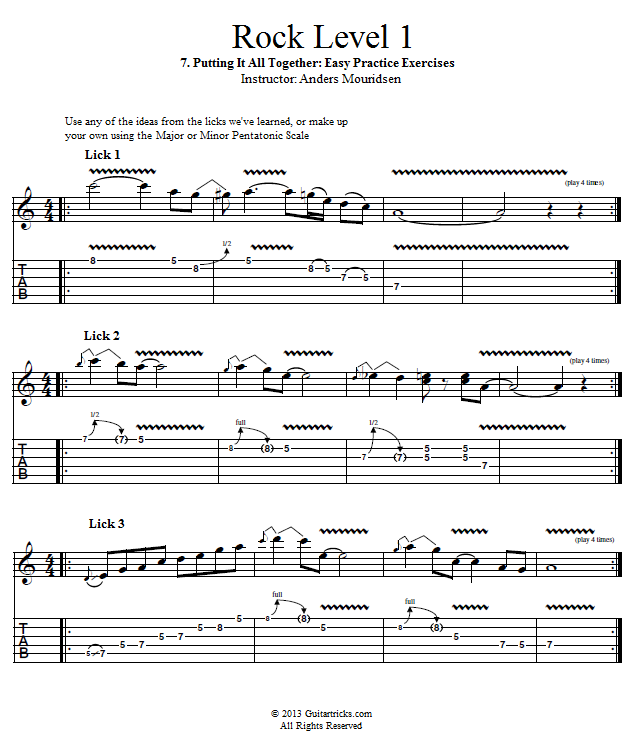 As you continue to improve your guitar playing, your vocabulary of licks, sounds, notes, and tricks will keep growing. But ultimately your ability to mix them all up, improvise, and be creative with them will determine how good you sound when you solo - much more than how much you know! So make sure you always take the time to work on being playful and creative and fearless with anything new you learn, before you rush to learn the next thing. Have fun with it!